Bromyard Local and Family History Centre01885 488755work MuseumBromyard Local and Family History Centre is the headquarters of The Bromyard and District Local History Society founded in 1966 to foster interest, enjoyment, research and publication in the field of our local history. The ground floor comprises a reception area and a well stocked shop selling local books, maps, postcards and many other items. Adjacent is a spacious Exhibition Room with a changing series of displays of local interest throughout the year. These include an interactive computer display of local photographs, and visitors may order copies of these to take away. The Society is well known for its fine collection of old photographs of Bromyard and surrounding villages, illustrating what life was like in bygone years. This collection has been gradually built up and added to ever since the foundation of the Society. It is unusual in that the catalogue index contains a very large number of personal names making it a particularly fine source of material for Family Historians. It consists of a large number of documents, books, maps and newspapers. There is also an important collection of photographs. .
Our purpose built archive Archive on the first floor is home to our large collection of local records. The facilities of the Research Room are outlined in our leaflet called Visiting the Local History Centre, and this is available on request. Suffice to say the Research Room provides a pleasant environment for both the casual enquiry and the serious student of family and local history. There are no charges for looking round the exhibits. However the Society is entirely dependent on donations to operate Bromyard Local and Family History Centre. The only charges in the Research Room are for additional services such as copies of photographs and documents, use of the Internet and research undertaken for you by Society members. 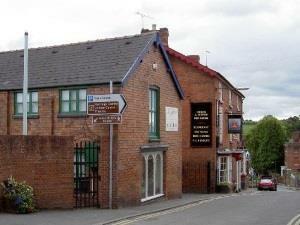 The History Centre building is situated at the top end of Sherford Street, between Bromyard's main Post Office, and the Crown & Sceptre public house. It is directly opposite the start of Broad Street on the local map. There are no parking facilities at the History Centre. However, there is a small amount of free parking in the square in front of the Hop Pole hotel, time limited on-street parking in both Broad Street and the High Street and free road side parking at the lower end of Sherford Street. The main fee-paying car park is at the other end of the town in Tenbury Road next to the Conquest Theatre.